DO YOU SEE THE WHITE EXPLOSION CLOUD IN THE LEFT TOWER? Please leave comments and tell me what your observations / conclusions are. To me nothing of the visual evidence really makes sense. See PlaneImpact and Damage. I suggest that China or Russia (or Iran, or France) recreates 20 floors worth of World Trade Center, and then flies a 767 into it... Only then we will know what the effect looks like. My guess is that it looks VERY different. Apart from the MISSING PLANE DEBRIS and the weird explosion it shows the simultaneous explosions IN THE OTHER TOWER (north tower). 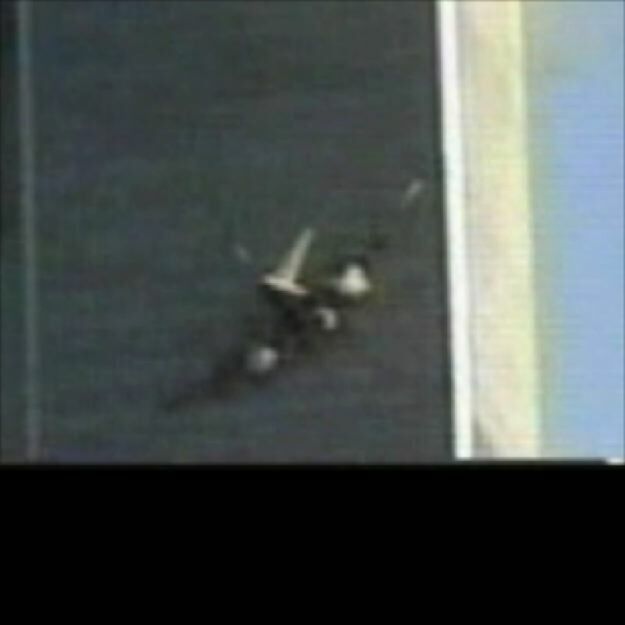 a person standing in the corner of the NORTH TOWER and at the exact moment the explosion happenes in the south tower, is he falling down... there is even a hint of explosion at the corner (above the N-tower-explosion-hole) where he was standing. 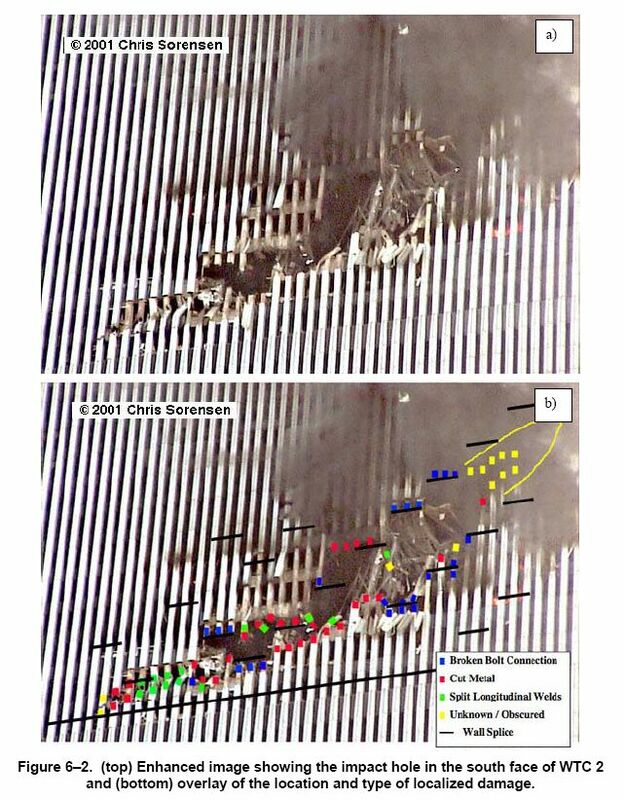 In other words.. it is CLEARLY shown that explosions in the NORTH TOWER happen at the exact moment that they exploded the SOUTH TOWER. The witness Rodriguez (WTC janitor) also described in his affidavit the huge explosions IN THE BASEMENT of the NORTH TOWER seconds B-E-F-O-R-E the explosion happens 80 floors above. There is more... please leave comments and lets collect evidence for SIMULTANEOUS EXPLOSIONS IN THE TOWERS. stallion4 on Fri, 09/15/2006 - 1:54am. what Ive never understood is when you watch some videos , when the plane hits there is screams of surprise and horror...other videos there is almost no audible response to witnessing a plane crash right above or near them. Some, as the one posted here, make me wonder who shot the footage and why they dont seem to surprised by it. You can clearly hear the man whistle as he pans out to show how much smoke there is as if that impresses him..but the plane crash doesnt get any response at all. justacitizen on Fri, 09/15/2006 - 3:54am. also...if the man is filming the burning tower, why is it the tower that gets hit is centerframe? Clearly, in my opinion, this man expected that tower to be hit. justacitizen on Fri, 09/15/2006 - 3:57am. medicis on Fri, 09/15/2006 - 4:09am. the white cloud on the other tower, is the explosion from the other side of the south tower, and at the angle the morning sun is hitting it it's illuminating all the dust particles. contrasted with the shadow on the other tower it looks anomolous. OWN the NWO on Fri, 09/15/2006 - 4:44am. What we are seeing in this photo, and indeed in all photos and videos showing what is thought to be evidence of secondary or "controlled" explosions", has a simple yet tragic explaination. As the heat of the fire severly weaken and compomised the strength of the girders holding the floors above them the concrete floors simply collapsed onto the floors below them. The air (filled with debris) was quickly expelled through the broken windows thus showing the "smoke" that we see in this picture and in the videos. This is the same as clapping your hands together and feeling the air being expelled from between the palms of your hands. Imagine if you had some powder in your hand as you quickly clapped them together...same effect as you are seeing in this picture. The powder is, in this case, the dust and debris being forced out through the broken windows of the tower as each floor above collapses into the floors below. This also accounts for the other "explosions" being heard by some of the firefighters as well. Jerseycityguy (not verified) on Fri, 09/15/2006 - 8:10am. bingo (not verified) on Fri, 09/15/2006 - 9:40am. This photo has been altered. This photo has been altered. The sky above the smoke is a different blue than that below. The smoke from the North Tower has been blackened also. Not a plane - a large missile for sure. brianv on Fri, 09/15/2006 - 10:29am. Brianv you are a fluffy animal. Handschuh is a professional photographer.. he probably used a sky-shading filter in fron of his lens. > a large missile for sure. How old are you? 6 years old? u2r2h on Sat, 09/16/2006 - 12:52am.